I had thought that I might move on to sparrows after rinishing my duck sketches and paintings. But we haven't seen much of anything other than House Sparrows and I don't really have too many sparrow photos. I do have a lot of wood warbler photos though, especially the friendly Canada Warblers that we see at Shenandoah National Park each spring. So it seemed appropriate to end the year and the beginning of the sparse gray season of winter with the jewel-like warblers. This drawing doesn't show any color since it's in pencil. Even if I did it in color you wouldn't see much since the bright yellow is on the underside and face. It contrasts with the blue-gray of the birds upper side. But I hope to do other drawings that show the underside and more of the face. Eventually I hope to do some watercolors. This drawing gets much more involved with individual feathers than I'm comfortable with. But I hope that by drawing them I'll learn more about them and eventually be able to do a shorthand version of them. Some people take pleasure in rendering each feather or feather tract. I don't, at lesat not all that much. But sometimes you really need to understand the structure of a bird before you can portray it faithfully in a more abbreviated manner. I was looking at Eric Ennion's 'The Living Birds of Eric Ennion' this morning. In it he showed some studies of a dead bird. The accompanying quote said that the artist needed to take every opportunity to study dead birds if he wants to accurately portray live ones. I think he meant by this that you can see structural details that you otherwise couldn't. Sometimes photos offer the same opportunity, perhaps like learning multiplication tables. It's a bit like rote learning. But that learning should help you to portray live birds in all their dynamic glory. Oddly enough the snow I painted yesterday is completely gone today. There's good and bad to this. Our yard is not as scenic. But it is a little bit easier to go out for a walk. We normally take a Christmas walk but cold and constant rain prevented that this year. Today though we headed out to the Wissahickon. Though in a valley, where ice and snow often doesn't melt, at least 90% of the snow was gone. So we had an easy, though somewhat sloppy walk. The great surprise was that it was warm enough to sit down on the benches at Valley Green and do some field sketching. 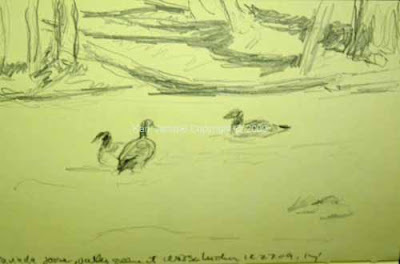 Who would have thought we could sit comfortably and sketch Canada Geese just a week after 24 inches of snow and weather in the 20s? As I said it was a great treat. There's always something enjoyable about working in the studio. There's greater artistic freedom, more artistic license. And I love that. But it's also nice to be outside drawing what is right in front of you. 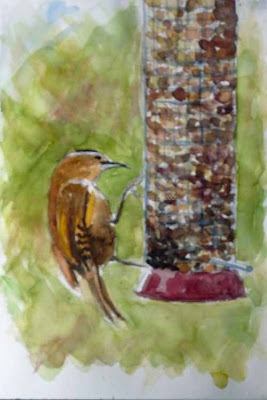 The watercolor was done in the studio based on one of the two field sketches. It's another 15-30 minute sketch. I got a bit sloppy with the heads and lost the white markings that should be there. But I did manage to get in much of the landscape and water. That's what I intended in the drawing and it's what I tried to keep in the sketch. There's much to be said for portraits of birds. But all in all for me, I'd prefer to show them in their environment, even if they might lose their pride of place. In any case that was the intent in these quick works. We had two feet of snow last weekend, setting a record for the last 100 years of record-keeping. It almost never snows before Christmas in Philadelphia, and when it does it's generally just a few inches that are gone before you can enjoy them. But not this year. At least 24 inches! You would have thought that might have brought more birds and more types of birds to the feeder. But it didn't. There were more House Sparrows than usual but that was about it. Today was even worse. There were NO birds. Yes no birds seen at our feeders during the entire day. The Sharp-shinned Hawk that's taken to sitting on our clothes pole next to the feeder might have some influence. But either he or a Cooper's make an appearance every few days and that never makes them disappear for the entire day. There were a few birds in neighboring yards though. Maybe they got better food for Christmas? 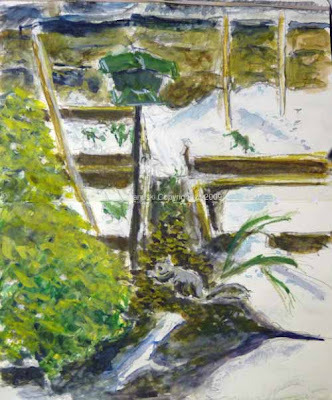 In any case as I looked out our backdoor I decided to do a pencil sketch of what I saw: much snow, one squirrel, a bird feeder on a pole, stone wall, four raised beds and a large Arbor Vitae, which generally hides and protects many birds. I do want to continue to work from life. If I can't find birds to draw in this colder weather it still makes sense to try foliage, snow, earth. At some point they'll be simportant component of a scene that does contain some birds. The work in some books I've received recently ('Portrait of a Living Marsh', 'The Silvery Tay' by Keith Brockie, and 'An Artist on Migration' by Bruce Pearson) all remind me of how much the surrounding environment can add to any art, bird or otherwise. The whole world waits to be portrayed. I wasn't really thrilled with the pencil results so decided to embellish the drawing with watercolor. That improved it somewhat but there was still something lacking. Finally I added some final modifications with gouache heightened watercolor. when there's no time to do anything except what's related to the holidays. So this little 30-60 minute watercolor was able to sneak itself in because it will be the basis of a holiday greeting card. Which holiday? Well probably Presidents' Day given the late date! I do continue to like Aquabee Super Deluxe sketchpad for these quick watercolors but the paper warps quickly when you use an overall wash as I have here. It's really better for just small strokes of paint, with not much water. This painting would be far better I'm sure on better paper. My brushmarks would be straighter and cleaner. But sometimes it's good to suffer through things like this because you appreciate the quality materials when you finally get them! Maybe someone will get me a whole load of good watercolor paper for Christmas! Then again that's not the most exciting present. Better scrounge some up myself. In case it's not obvious this is a Carolina Wren on our peanut feeder. "I don't believe an artist can influence the solutions to ecological, or social, problems -- as soon as he tries to do that, his work becomes edifying and boring. "But art that is sincere will bring the artist's love for his surroundings across to other people who maybe fail to see the beauty. Only in this way can an artist contribute to the solution of the problems of society -- but it is a process that takes time and often produces disappointing results." I don't know all that much about ANF so I'm not going to write about it. More information can be found at their website. If you go to this page, then click on 'Read more', you'll get a lengthy PDF article on ANF, full of many great illustrations and a lot of history. It may download or display in your browser, depending on how you have your browser set up. I have to say I'm mightily impressed by this book. It includes essays on the ecology of this area of Poland, coupled with over 100 drawings and paintings by world famous wildlife artists who went there as a field expedition of ANF. They did this in the early 1990s. ANF has done many other such projects. I have to confess that I had never heard of many of the artists, including Vadim Gorbatov, whom I quoted at top. But I have thoroughly enjoyed the artwork and the essays. There is such a feel of honest concern for nature and honest love of portraying it. I think that's why the Gorbatov quote struck me. The best way to convince others of the value and beauty of nature, or anything else for that matter, is by portraying your own love for it. I originally posted this last night without any artwork. I just hate doing that. 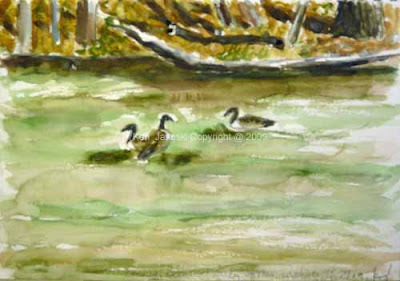 So this morning I did this 30 minute watercolor of a Wood Duck and ducklings at Tinicum. I can't say it's a great step forward. But it is something to look at. As I finish up my ducks series I've run into a bit of a problem: some duds after those pintails I was so happy with. 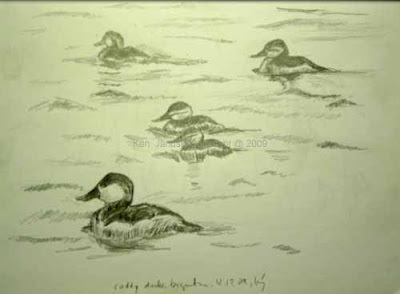 Thus the title: (DUD)dy Rucks, rather than what they actually represent, Ruddy Ducks. But I hadn't posted or done much artwork in awhile so I wanted to post something. 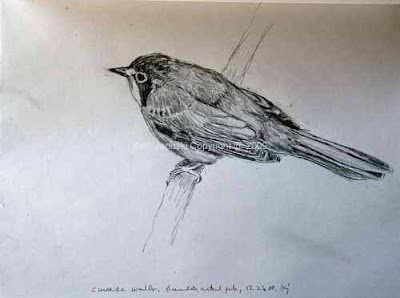 A combination of few field sketches, distant photos lacking in detail and lack of practice was a problem. 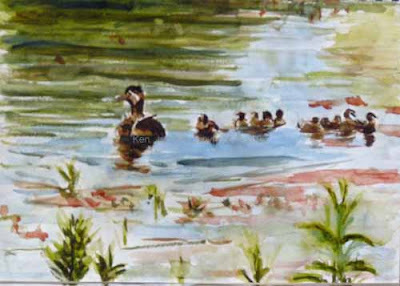 Compounding the problems were that these ducks, unlike all the others I've portrayed, were in deeper, choppier water. They are diving ducks, not dabbling ducks. So waves lapped against their sides, negating a clean lower silhouette. In addition it's been hard to portray the choppiness of the water in this part of Brigantine NWR, where I saw them. 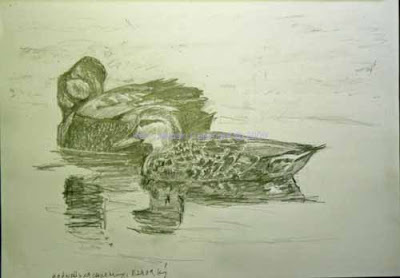 Until I started on these two I didn't realize how placid the water was in my other duck paintings and drawings. All in all though this is something to be happy about. The natural world is a complex place. And I'd rather have something new to portray than something I might get bored with. Nonetheless I can see that learning to portay choppy water will be a long-term project. Not that I'd really conquered still water. But the challenge is what keeps art exciting. 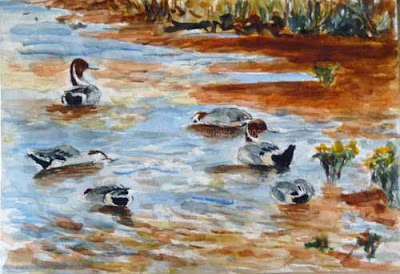 Who would have thought that the photos I took of Northern Pintails at Brigantine NWR at the end of October would be the source of so many sketches and watercolors? 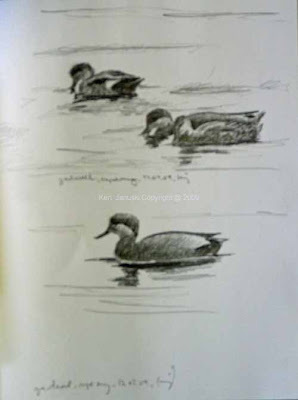 I suppose it was a combination of numerous good photos and the previous time I'd spent on other ducks, especially doing sketches of them. By the time I got to the Pintails I was ready to break loose from the detailed work I'd been doing into something more painterly. I've had two main purposes in my recent duck work: one, do enough detailed pencil sketches so that I feel like I'm actually getting to understand ducks, and two, do enough short watercolor sketches that I become looser with it, but still don't become so loose as to abandon everything I've learned about detail. I'm happy with the results, at least in terms of what I've learned. All of the works I've done are on lower quality paper. That allowed me not to get too precious about them. Nothing can kill good art quicker than preciousness. 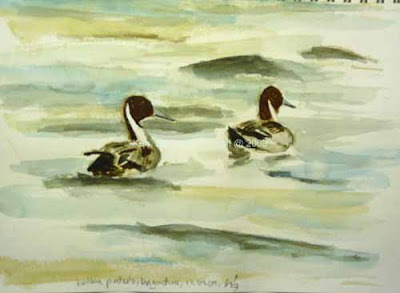 I'm particularly happy with a couple of the watercolors of Pintails. The one at top is very overworked. The Aquabee Super Deluxe sketchbook that I've been using for the watercolors is very versatile and amazingly sturdy for a sketchbook paper. Still it couldn't hold up very well to all I did on the first painting. But that is not the fault of the paper. It's mine. I just wanted to keep working until I got what I wanted. And to a large extent I got what I wanted: a complete painting. I think more than anything else I've wanted to be able to do both bird art and watercolor in the same way I used to do abstraction and oil, as a vehicle for something ambitious, or at least something that seems full, not just a sketch. Both birds and watercolor lend themselves to sketches and I love this aspect of bird art and watercolor. There can be a quick sketchiness that seems like life itself. But there are other times where I'd like to do something fuller and richer. The painting at top makes me think that this might eventually be possible. I'm starting to feel like a craftsman who's started to get familiar with his tools and can now start practicing his craft. At least I'm pretty sure it wasn't. I was flipping through famous British artist Charles Tunnicliffe's 'A Sketchbook of Birds' today. 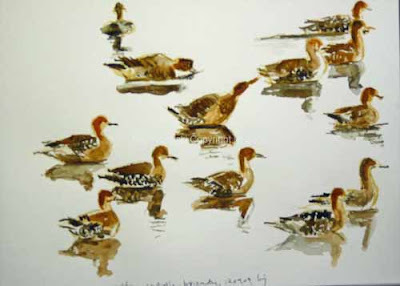 One of the works that particularly struck me was a watercolor of 10-15 Northern Pintails all in a group. It struck me as did all of his duck works because that's what I've been working with recently. 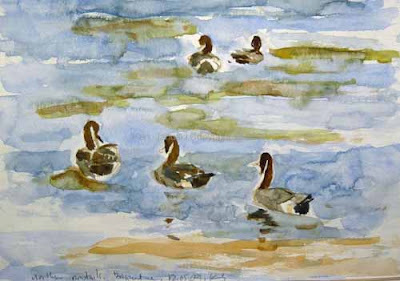 I think instead the real motivation behind the accompanying watercolor of 12 female Northern Pintails was just one of reaction. I couldn't stand doing any more detailed pencil work! Well not really. I've enjoyed it. But I did feel like doing some watercolors that almost by definition wouldn't be as detailed. So there are two here. 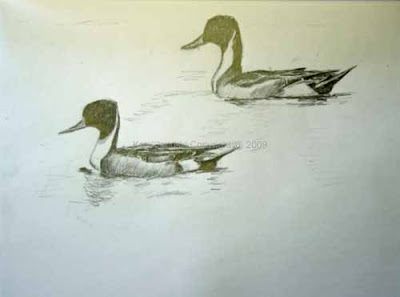 The first one I did of two male Pintails is a quick 15-30 minute watercolor. I drew in the shapes loosely first. The second, and the one I'm particularly fond of, was done without pencil. 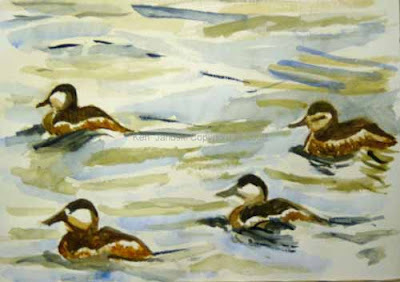 I just started sketching in all of the ducks in very light watercolor lines. As it progressed I added more shape and darker color. It felt much more like painting and I thoroughly enjoyed it. Anyone who's watched ducks knows that they can sometimes dabble quite vigorously. 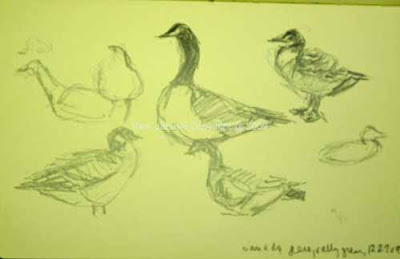 But here I'm just using it as a metaphor for my slow unhurried way with the duck sketches I'm including today. They're done at a slow pace, done when I've found a few minutes to slip in another sketch. Today's dabbling ducks include Gadwalls and two Northern Pintails. My Gadwall photos aren't great so they'e a bit lacking in detail. I have a number of good Pintail photos that I took in October at Brigantine and Cape May so there will be more of them, hopefully showing some detail.